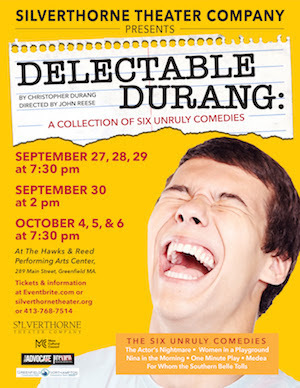 This production will be an ‘homage to the theater‘ featuring Durang’s most pungent satirical takes on the world of the stage. The six plays are The Actor’s Nightmare, Women in a Play Ground, Nina in the Morning, For Whom the Southern Belle Tolls, One Minute Play & Medea. Every theatrical element will be in full view of the audience throughout, as the actors function as a mini-repertory company, portraying a variety of multi-dimensional characters with serious personal issues who fearlessly leap into Durang’s world of comic mayhem with emotional abandon and a bountiful sense of play.